This article contains fast, interesting, fun facts about Shai for research, schools, students and kids providing an insight into the lives and religious beliefs of the ancient Egyptians. Shay existed as both a concept as in destiny and fate and as a deity in the form of the god. 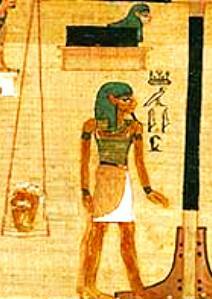 The above picture depicts the god and is taken from the the weighing of the heart scene in the Book of Ani, a funerary text from the New Kingdom. The ancient Egyptians were highly superstitious and believed that it was futile to endlessly pursue riches as no one could ignore 'shay', their fate. During the religious revolution in the 18th Dynasty of the New Kingdom, initiated by the 'heretic pharaoh' Akhenaten, the one god he worshipped was described as "the Shay who gives life". The mythical rituals of the Underworld, in particular the weighing of the heart to determine the eternal fate of a soul of the dead. He was able to recount the events that had happened in the life of the deceased. 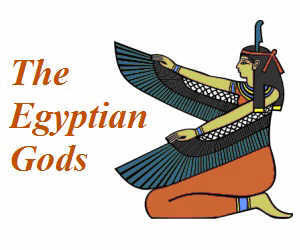 He was frequently mentioned in relation to the ancient Egyptian gods of fate including Renenutet the cobra goddess of good fortune, fate and of happiness and Meskhenet, the goddess of childbirth and destiny. Like Renenutet, he was connected with the determination of the allotted life-span of a human being. He and Renenutet were seen as helpers to the god Thoth, the scribe of the Underworld, wrote the results of the judgement of every soul. The 'Seven Hathors' were believed to be the personification of destiny, the weavers of fate who determined when life began, when it ended and all that happened in between. As a god of destiny, fate and fortune, he was perceived as being either a positive or negative influence on life, bringing good fortune or bad luck. Facts and information about Shai for kids with some amazing, cool and quick information about ancient Egypt and Egyptians. These fast interesting facts about Shai are ideal for children, homework, schools, teachers and kids of all ages.